February 9, 2019 | Kevin M. Mazza, Esq. In my last blog post, I provided a brief overview of retirement assets which have been funded individually, such as IRA accounts, and how they are dealt with for equitable distribution purposes. In this second blog post of the series, I will now provide an overview of employer-sponsored retirement assets and how they are dealt with in divorce. While some people may accumulate retirement assets in IRA’s, most people accumulate retirement assets through their employment. Such employment-based retirement assets usually come in two forms, to wit (1) a defined benefit plan or (2) a defined contribution plan. Exceedingly less common than in years past, a defined benefit plan is what most people remember as a traditional pension plan. Generally employer-funded, these types of plans generate a monthly “benefit” or payment to an employee upon retirement either for a specified number of years or during his or her lifetime. That monthly benefit is determined based upon a formula considering factors such as earnings, duration of employment, age and life expectancy. Only a dwindling percentage of private employers offer such defined benefit plans at this juncture. These types of “benefit” plans remain the norm for most public or government employees; however, they are generally not considered “qualified” which impacts how they are distributed upon divorce. Most private employers sponsor defined contribution plans, most commonly in the form of 401k accounts. In these types of plans, an employee may voluntarily elect to contribute a certain amount or percentage of his gross income into a dedicated retirement savings/investment account, a portion of which contribution may or may not be “matched” by the employer. The amounts contributed are “pre-tax”, meaning that you do not pay taxes on it during the year of contribution, and that monies accumulated in that account grow tax-free. How are these types of employer-sponsored retirement assets handled by way of equitable distribution? Because they are the most common, and generally less complicated, I will discuss defined contribution plans first. And because they are the most common form of defined contribution plan, I will refer to 401k plans in my discussion. Indeed, many of the comments about IRA accounts contained in my prior blog post would also apply to these types of plans. When we refer to “401k”, it is referring to the federal statutory provision authorizing these types of plans. In many instances, 401k-type plans are frequently referred to as Retirement “Savings” Plans, because that is precisely what they are – a mechanism afforded employee-participants to save for retirement tax-deferred. To the extent 401k’s were funded during the course of the marriage, they would be subject to equitable distribution. Certainly this would be true with regard to any amounts which the employee-spouse contributed directly into the 401k. This would also generally be true with regard to amounts which the employer may “match” in regards to an employee’s contribution. However, the amount of an employer match is sometimes subject to certain “vesting” requirements before the employee is entitled to it. Usually this takes the form of the employee continuing to work for the employer for a certain period of time, or for a certain time to pass before the matched amounts are deemed “vested”. Does this mean that if an amount is not “vested”, it is not subject to equitable distribution? Generally, the answer is no. A right to a matching contribution accrued during the marriage, even if not yet “vested” generally remains subject to equitable distribution. For example, if the length of employment and/or length of time requirements are subsequently satisfied and the “match” vests, the marital portion would then become subject to equitable distribution. However, if the employee failed to meet the matching requirements, such as having left or been terminated from employment, rendering the employee ineligible to receive the matching contributions, there would be nothing to equitably distribute. Simply stated, if a right was accrued during the marriage, and that right is subsequently vested, it remains subject to equitable distribution. Again, it is amounts contributed to or accrued during the course of the marriage which are subject to equitable distribution. If an employee spouse did not commence making contributions until after the date of marriage, figuring out this amount is usually straightforward. One need only look at the balance in the plan as of the date the divorce complaint was filed and that is the amount which would be subject to equitable distribution, along with any gains or losses on that amount to the actual date of distribution. Any contributions made subsequent to the date of the divorce complaint would generally not be considered subject to equitable distribution. However, what if the employee-spouse had already been making contributions into the plan before the parties were married? Generally, those contributions would be deemed “premarital” and therefore not subject to equitable distribution. Unfortunately, valuing the premarital versus marital components are not always easy to determine. Generally, it is not simply a matter of subtracting the date of marriage balance from the date of complaint balance to determine the amount which is marital. The premarital balance was subject to investment experience (gains or losses) during the marriage, and which is also part of the date of complaint balance. Calculating this “investment experience” is often a difficult task, depending upon the length of the marriage, the nature of the investments and the availability of historical statements or records. Hopefully, the Plan Administrator might be willing and able to make these calculations. If not, you may need to retain a pension expert to do these calculations. Once you determine the marital component of a defined contribution plan, how is it’s equitable distribution actually effectuated? Assuming the plan is “qualified”, there are limitations imposed upon how the contents thereof can be distributed, transferred or otherwise alienated. An employee spouse cannot simply withdraw funds and transfer them to his or her spouse; nor can an employer or plan administrator do so at the direction of an employee or even through the filling out of transfer forms like with a rollover of an IRA. The law does allow transfers of benefits accrued in a qualified defined contribution plan incident to a divorce, but only if certain conditions are met, and only through the use and entry of what is known as a Qualified Domestic Relations Order, commonly known as a QDRO. I could devote an entire book discussing the intricacies of QDRO’s, but will not do so at this time. 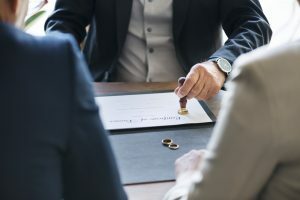 Needless to say, a QDRO is generally required to distribute the marital portion of a defined contribution plan between spouses incident to a divorce. Once it is determined what portion the non-employee spouse will receive (usually delineated as a specific amount or a specific percentage, and usually subject to gains and losses to the date of distribution), a QDRO will be prepared reflecting same in accordance with the terms of a Judgment of Divorce or incorporated Property Settlement Agreement, which is then entered by the court and submitted to the Plan Administrator for qualification and implementation. The amount of the non-employee spouse’s share is either segregated and maintained within the plan, or is rolled over by way of a tax-free transfer into an IRA account established by the non-employee spouse, also referred to as the alternate payee, which he or she may establish. It should be noted that just like with IRA’s, if both spouses happen to have marital benefits accrued in his or her own defined contribution plans, rather than having multiple QDRO’s and multiple transfers for each account, it is frequently the practice to offset these various benefits and distribute the difference, which hopefully can be accomplished with just one QDRO. Again, this can be done where you are comparing apples to apples, and not apples to oranges. You must compare tax-deferred assets to tax-deferred assets, and not tax-deferred assets to regular savings or investments which have been funded with after-tax dollars. What about defined benefit plans? Their treatment for equitable distribution purposes is somewhat more complicated. Unlike a defined contribution plan or 401k, its “value” is not a sum certain of money or balance that you can read from a statement. Rather, it is the right to receive a payment or benefit on a regular or recurring basis, usually monthly upon “retirement” (be that reaching a certain age and/or a certain level of service) and payable for a certain length of time (usually one’s lifetime). The amount of such a defined benefit which would be subject to equitable distribution is generally determined by applying what has come to be known as a coverture fraction whereby the amount of the benefit is multiplied by a fraction in which the numerator, or top portion of the fraction, equals the number of months in the plan during the course of the marriage over the denominator, or bottom portion of the fraction which is the total number of months the employee spouse has participated in the plan. For simplicity’s sake, if an employee spouse was a participant in the plan for a total of 30 years of which only 15 were during the marriage, then only 50% of the benefit would be deemed marital and subject to equitable distribution. Individual intricacies of various plans may impact this analysis, as such, it is recommended that retaining a pension expert to analyze same might be prudent. After determining what portion of a defined benefit plan is marital, how does one effectuate its equitable distribution? Assuming that it is a qualified plan, the most common approach is to do so by way of QDRO. That QDRO would need to specifically identify, and generally by reference to a coverture fraction, which portion of the participant spouse’s benefits are being awarded to the alternate payee spouse. Again, it is prudent that a pension expert be retained to draft the QDRO for entry by the court and submission to the plan administrator for qualification and implementation. However, unlike a defined contribution plan where there may be a segregation or rollover of a sum certain to the alternate payee, the alternate payee would be deemed entitled to receive the defined portion of the monthly benefits when eligible to go to pay status under the terms of the plan. Again, for simplicity’s sake, let’s say the participant spouse was employed by a company and a participant in their defined benefit plan for a total of 30 years, of which 15 were during the marriage, and assuming the participant spouse would be eligible to receive a $4,000 per month benefit, then only half of which, or $2,000, would be deemed marital. Assuming that the non-employee spouse or alternate payee was to receive 50% thereof as her share of equitable distribution, the alternate payee would receive the sum of $1,000 per month. There are numerous variables which would impact these numbers and calculations, such that the above example is offered for illustrative purposes only. Is there another way to effectuate an equitable distribution of a defined benefit plan rather than by way of QDRO? One can attempt to “value” the marital portion of the defined benefit plan. What does this mean? Essentially, one would endeavor to reduce to a “present value” the amount of a benefit payable in the future. For example, what is the present value of a $1,000 per month benefit starting at age 65 and payable for the remainder of that person’s lifetime? In this instance, a pension expert or an actuarial expert would need to be retained to do this kind of analysis. Assuming that a “value” for those future defined benefit rights is arrived at, you can attempt to offset that value against other assets, or to otherwise “buy-out” the other spouse’s interest, assuming that there are the means with which to do so. However, for the participant spouse, proceeding in this fashion clearly has risks, such as actually living long enough to receive the benefits that you are paying your spouse off for. Hence, distributing defined benefit plan by way of QDRO is often the more prudent option. As noted earlier, defined benefit plans in the private sector are getting rarer and rarer. More often, these types of pension benefits arise in the public sector, including federal, state or local governmental employees. Technically, these types of public employee pensions are not covered under ERISA, and as such, are not considered “qualified” plans. Hence, they are not actually distributable by way of a QDRO. That is not to say that such public employee pension benefits are not divisible in a divorce. They are. However, rather than the non-employee spouse receiving her own separate benefit rights, his or her rights would be derivative of the other spouse, and as a result, would generally receive a specified amount or percentage of the employee spouse’s benefits at such time as they go into pay status, more akin to a garnishment or execution if you will. Often this is accomplished by an order similar to a QDRO. My last two blog posts are intended to provide just an overview of what is involved with regard to the distribution of retirement assets in divorce. Again, since retirement assets represent a growing portion of the marital estate subject to equitable distribution, awareness of these issues, their intricacies and their complexities is extraordinarily important. Given their many years of dealing with such matters, let the attorneys of James P. Yudes, PC help guide you through this process.